Brigadier General Zoppi is the Deputy Commanding General – Support under the 200th Military Police Command at Fort Meade, Maryland. 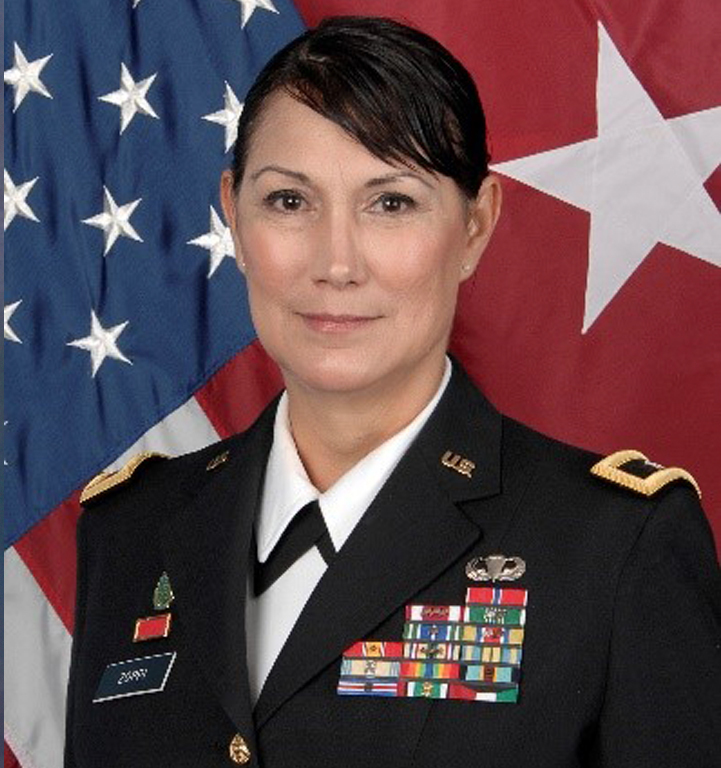 Previously, she served as the SOUTHCOM Army Reserve Elements Commander/J2 with the 76th Operational Response Command based in Miami, Florida working with partnerships throughout Latin America and the Caribbean. Native from Canóvanas, Puerto Rico, Brig. Gen. Zoppi began her military career as a private first class in 1985 with the Military Police Corps at Ft. McClellan, Alabama. In 1988 she commissioned as a second lieutenant after graduating from the University of Puerto Rico, Rio Piedras Campus. Her numerous leadership assignments include Deputy Commander for Readiness, Mission Support Element under the 200th Military Police Command; Deputy Commander & Chief of Staff, 1st Mission Support Command; Group/Brigade Commander, Strategic Intelligence Group; Battalion Commander, 203rd Military Intelligence Battalion (Technical Intelligence); Assistant J2, Chief Intelligence Officer, Joint Task Force, National Command Region, NORTHCOM; Battalion Commander, 11th Battalion, 3rd Brigade, 104th Division (Leadership Development) and other key joint assignments including a deployment with the 3rd Armored Division during the Gulf War. Brig. Gen. Zoppi is a graduate of the Army War College, Advanced Joint Professional Military Education, Command and General Staff College, the Combined Arms Service Staff School and is branched qualified in Military Police, Military Intelligence, Civil Affairs and Public Affairs. She holds a Master of Strategic Studies degree from the U.S. Army War and a Doctorate in Philosophy from the University of Maryland. She received a Women’s Leadership Certificate from Harvard Business School. She also holds a Master of Business Administration and a Master of Science in Business, Marketing from Johns Hopkins University and holds a Bachelor of Arts in Modern Languages: Italian, French and German from the University of Puerto Rico. Brig. Gen. Zoppi’s awards and decorations include: Bronze Star Medal, Meritorious Service Medal (with 3 oak leaf clusters), Army Commendation Medal (with 6 oak leaf clusters), Southwest Asia Service Medal (with 3 bronze stars), Kuwait Liberation Medal (Kingdom of Saudi Arabia), Kuwait Liberation Medal (Government of Kuwait) and U.S. Army Parachutist Badge. Brig. Gen. Zoppi also received the Military Intelligence Excellence Knowlton Award in 2013. As a civilian, Dr. Zoppi serves as a Program Director for the National Intelligence University under the Department of Defense. She is also a member of the Maryland State Board of Education. Her civilian awards, certifications and decorations include: Latina of Influence Award by the Hispanic Lifestyle Magazine (2016); Faculty of Excellence Award, Strayer University, 120th Commencement, Baltimore, Maryland; Maryland’s Top 100 Women, Kentucky Colonel, Honorable Order of Kentucky Colonels. Brig. Gen. Zoppi is married to Thomas J. Zoppi. They have three children and two grandchildren.